NIAGARA FALLS, ON--(Marketwired - Dec 14, 2016) - A treat for wine connoisseurs, foodies and those who simply enjoy fine entertainment, more than two weeks of festivities are planned for the Niagara Icewine Festival, January 13-29, 2017. Wineries are ramping up for the celebration of Ontario's popular icewine, as are organizers of local events. Festival enthusiasts are booking Niagara Falls hotel accommodations and setting their sights on advance tickets to popular events including Discovery Pass Experiences for wine and culinary adventures at local wineries across the area. Icewine is a proclaimed dessert wine created from grapes that have been frozen while still on the vine. A large percentage of Canada's icewine comes from the Ontario area. 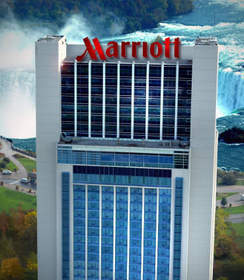 Uniquely perched on Fallsview Boulevard and offering hotel rooms and suites with spectacular views, the Niagara Falls Marriott on the Falls is conveniently positioned near Scotiabank Convention Centre, Fallsview Casino, Seneca Casino, the Butterfly Conservatory and more. The hotel's prime location, innovative accommodations and intuitive service are ideal for enjoying a stylish stay while exploring local wineries and taking advantage of the many other things to do in this exciting Ontario area. Festival goers can easily secure hotel accommodations online at http://www.marriott.com/hotels/travel/iagmc-niagara-falls-marriott-on-the-falls/ or by calling 800-267-8439, toll free. Xerox "Sugar & Spice...Everything Ice" Icewine Gala. This all-inclusive formal event is set for Jan. 13 at the Fallsview Casino and Resort and will feature more than 100 VQA Icewines and table wines from over 35 award-winning wineries. Tickets for this event are available at http://www.niagarawinefestival.com/xerox-icewine-gala. Discovery Pass Experiences - Celebrating for three weekends in January, local wineries are participating in the festival's tasting experience adventure. Each pass may be used for wine tasting and culinary pairings at any of the more than 35 participating wineries. The passes may be redeemed Friday through Sunday, each weekend of the Niagara Icewine Festival, and do not have to be used in one day. For detailed information and to purchase online, visit http://www.niagarawinefestival.com/discovery-pass-experiences. Niagara Falls Icewine Festival at Scotiabank Convention Centre. This ticketed event is set for Jan. 27-29 and will feature premium VQA Wines and Icewines from more than 20 local wineries. Dishes, prepared by 10 of the Niagara's Top Culinary Chefs, will also be featured along with musical entertainment. An outdoor Icewine Winter Wonderland completes the setting, featuring ice sculptures and lights. Tickets for the three-day event in Niagara Falls are now available at http://icewinefestivals.com/. The Niagara Falls Marriott on the Falls hotel offers a discerning destination overlooking one of the world's most spectacular natural wonders. Allowing guests the unique opportunity to seamlessly blend work and play, the Ontario, Canada hotel's position on Niagara Falls is exciting and awe-inspiring. Featuring an expansive offering of guest rooms and suites, many with breathtaking views and some with fireplaces and whirlpool tubs, the hotel pampers all of its guests with the convenience of three on-site restaurants, an indoor pool and well-equipped fitness center. Whether planning a small meeting or large conference for up to 1,200 persons, the hotel's event space, professional catering and event management services are designed to ensure success. Niagara Falls Marriott on the Falls is conveniently located near Scotiabank Convention Centre, providing the best accommodations for this year's Icewine Festival events.